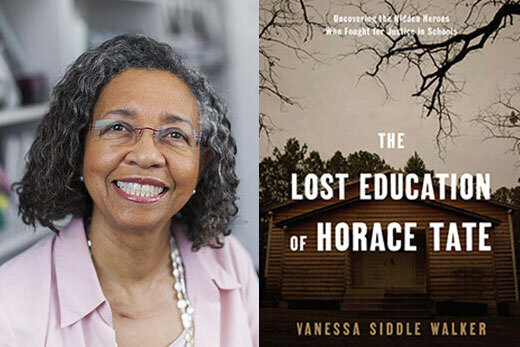 Vanessa Siddle Walker, Samuel Candler Dobbs Professor of African American Studies at Emory College, will discuss the civil rights movement’s hidden heroes she uncovered in her research at an appearance February in Atlanta. Walker, who has studied segregated schooling for more than 25 years, last year published “The Lost Education of Horace Tate,” which details the hidden network of black educators who laid the groundwork for Brown v. Education – and struggled with the aftermath. Records amassed by Tate, a former Georgia state senator and head of the segregation-era Georgia Teachers and Education Association, provided Walker evidence of the often-secret work black educators did to help African American students. The book was met with critical acclaim, including a lengthy review in the Wall Street Journal, when it was published last summer. The book recently got renewed attention after a photo of LA Clippers forward Tobias Harris carrying it made the rounds on social media and on Harris’ own Twitter page. The Baton Foundation is sponsoring Walker’s lecture and book signing Feb. 10 from 3-5 p.m. at the Auburn Avenue Research Library. The program is free and open to the public. Walker, who has also authored and edited several other prominent scholarly books including “Their Highest Potential: An African American School Community in the Segregated South,” will become president of the American Educational Research Association (AERA) in April. Her research has received numerous awards, including the prestigious Grawemeyer Award for Education and three awards from the AERA, including categories of Best New Female Scholar, Best New Book and Outstanding Book.